HeartCode® BLS is an online blended learning course that combines the convenience and self-pacing of online learning with the hands-on application of a classroom environment. With blended learning, students complete the cognitive portion of a course on a self-directed basis online. Following this, students attend an Instructor-led classroom portion focused on meaningful skills practice, debriefing, and skills testing. 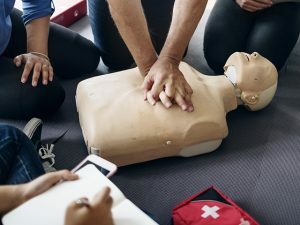 This class can be held at our facility in Raleigh, North Carolina, or we can set up on-site CPR training for a group of six or more.